Undergoing some renovation, i.e. a wall has been knocked off and creating one unique space from two rooms. The room at the back used to have a cold pitched roof, will now have a flat warm roof and the RSJ will be exposed. How to read the image below: the grey shapes are the walls (double skins), the black blocks are the padstones and the red rectangular is the steel; where there are gaps between outer and inner leaf stands for a small cavity. The steel is sitting halfway on the external padstone, will this cause thermal bridging? I suppose some TB will be happening, but is it indeed an acceptable thermal bridging (as that's how it is always done according to builders) or is it going to be very compromising? 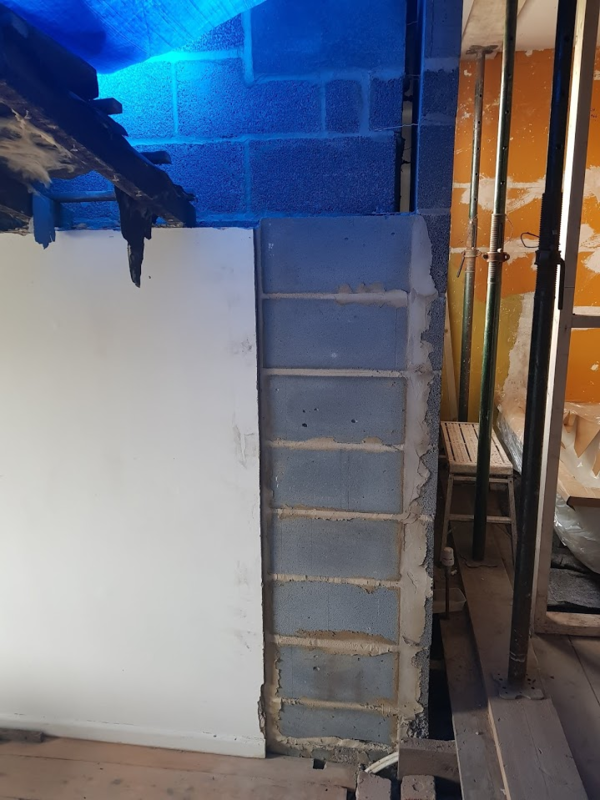 If it is very compromising, how to minimise thermal bridging as much as possible, seeing the steel is actually already in situ and builders are very adamant that there is nothing to worry about and are laying bricks at the moment? very important point I have missed, the steel is left exposed in the room as a feature. Posted By: SpaceTofu very important point I have missed, the steel is left exposed in the room as a feature. Surely that's not allowed by fire safety building regs? to my knowledge it is, as long as it is painted with red oxyde fire retardant paint, which it is? cover it? do you like it as a feature? Bare RSJs can be v handsome, hi-tech (or old warehouse) style - better than a smeared-over clueless boxing, thinking it'll be thereby invisible. But how about a hefty timber beam instead? I do love an old beam. but unfortunately we live in the city and I think old beams feel much more at home in the countryside. Said this, I can expect that for your standard SE and builders dealing with an RSJ is much easier than dealing with a timber, actually the RSJ was already quite exotic than the concrete beam they suggested. 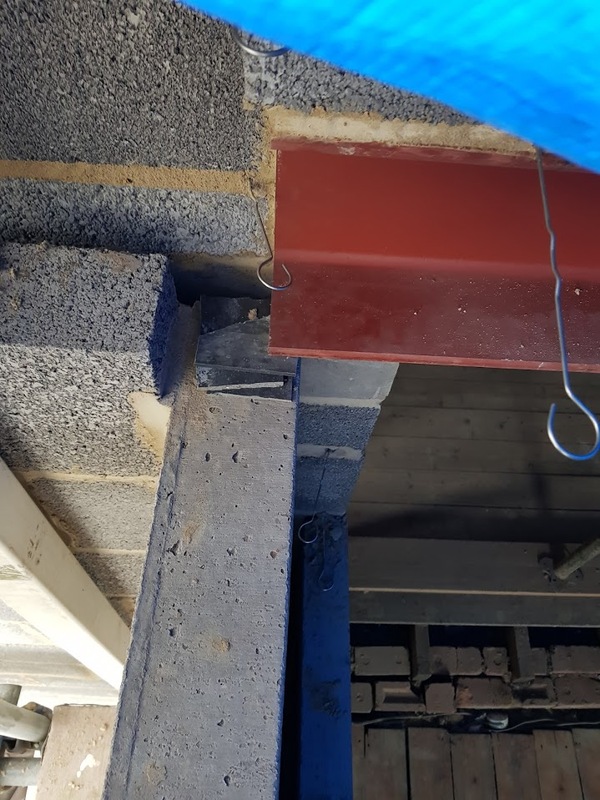 Anyway, we do like the look of the RSJ and it is all in place now, so it is just a matter of understanding whether thermal bridging is a probable risk in our situation and how can we physically diminish the effects of that risk. Here is a picture hoping it helps better in visualising it. I really appreciate your inputs, I have challenged builders twice and they told me it is all fine and it is how it is always done and that I should regard myself as lucky that the steel doesn't go all the way across the building and literally out! My only hope is - unless I am worrying over nothing, hence why I am writing here - that BC will say it is badly realised. Looking at the regs - if the beam is structural (and it looks like it is) it has to survive 30 minutes in a fire - you will need an intumescent coating on that steel designed to bubble up and expand in a fire to stop the steel getting hot. The red oxide paint may be resistant to heat but unless it is intumescent it will not protect the steel in a fire. Steel is pathetically weak in a fire and will fail if allowed to get too hot. Insulation wise - if the steel is basically exposed on the inside you should do all you can to isolate it from the cold on the outside. What goodevans said. Technically, your beam is almost certainly a thermal bridge. Whether you care about that is the question. Thank you for your inputs, I really, really appreciate them, it is our first renovation project so there is definitely a lot to learn. About fire risks: the builders said they had ordered the RSJ in red oxyde so to make it fire resistant, as they have always been aware of our desire of leaving it exposed. Is there some ways I can check whether the red oxyde is intumescent or not, or simply put distrust is the way to go about it? Thanks for confirming the steel is a thermal bridge. I thought I was really turning myself paranoid about it. What would be the best course of action now? We really wouldn't want to consider taking the steel down and re-arranging everything (e.g. building a tiny pillar adjacent to the inner leaf) to avoid TB. Can we cap it somehow? I was reading about aerogel caps, but it seems they are not particularly readily available on the net. Do you think if we were to pad the end with some XPS would be good enough? The steel is sitting for 35mm on the padstone and the padstone is 95 mm wide. 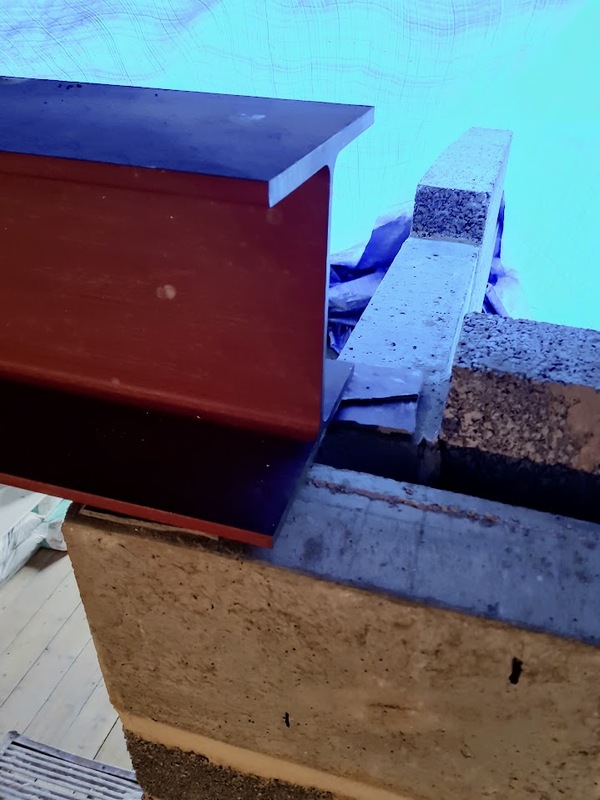 And the more tricky bit is actually, the steel is in fact sitting already sitting with the bottom bit on the external padstone with two slates sandwiched in between, so it is actually already thermally bridged there. Anyway of changing that configuration or there is really no way around it? BC is due to be here on Monday so we will pick their brains. However we really wouldn't like to take the steel down and re-design the whole thing, our house has been without a roof for almost 10 days now and it is really impacting our lives; unfortunately the finishing off of the roof is dependant on the steel. Posted By: SpaceTofu old beams feel much more at home in the countryside. Have You Ever Been To York ? Short of the specification for the paint on the steel I can only think of destructive tests such as this one: https://www.youtube.com/watch?v=FaVblCHQjVY. These paints need to be applied at the correct thickness to achieve the necessary expansion to protect the steel the paint in the video is 1mm thick before it was lit up. I am not a builder but I would suggest rendering onto something like cement board instead of plasterboard. Unless you wish to have the beam modified so that it is supported entirely on the internal skin it looks like you are kind of stuck - The beam end will take the cold from the external skin and transfer it to the internal skin as well as along the beam (or the warm will travel from inside along the steel to the outside skin) - eps or rockwool on the end of the steel will help - fortunately the steel isn't exposed directly to the outside which would be worse. Inside you may suffer with condensation on the steel or the wall nearby when it is particularly cold outside - but it should be no worse than you would get with single glazing. goodevans, not to worry, I'm a safety freak and I won't take the fire resistance of the RSJ lightly, we will definitely get the BC opinion on Monday. Further, when lugging the steel around it has been scratched so it does need a lick of paint anyway, so I am more than happy to give the intumescent paint myself, I saw they sell paint which guarantees the structural integrity up to 120 minutes! Unfortunately indeed we are kind of stuck. I guess my two questions here are: as the beam is essentially a massive heatsink and it is sitting marginally on an external padstone, am I correct in thinking that padding the face and top of it would only slow down the transmission of heat, but the final exchange of heat would be the same? And second question is, can't we remove the slates and external padstone to replace them with some sort of material that has enough compressive strength and it is insulating too? Or I guess such a material doesn't exist? Yeah red oxide is definitely not fireproof, intumescent or anything other than a feeble anti-rust coating. I think it's clear that your builders either don't know and understand what's required and good practice, or are trying to pull the wool over your eyes. Hopefully the BCO can help clear things up. If you could support the beam temporarily, then you should be able to take out the slates and external padstone and replace them with something like a foamglass block, or even compacfoam. Then if you wrapped the end, sides and top of the beam with some other insulation, things would be in better shape. I think you can buy aerogel in sheets and cut it to shape. That would probably be most effective given the limited room, and reasonable economical given the small amount that would be needed. Otherwise, look at insulation with the best lambda value. Given there's more work needed, I hope you haven't paid your builders yet. I think they're not necessarily bad people, surely they don't like to go "OTT", so it is simple as that probably. The beam can definitely be temporarily supported for temporary work (anyway it is mostly sitting on an internal padstone), however I had a look into foamglass block and compactfoam and they have a compression strength equal to respectively 2.75 N/mm^2 and 10 N/mm^2, which really don't match the 50 N/mm^2 that a concrete padstone can support, or am I missing something here? Further, I am starting to be even more worried that if I manage to pad only the end and top of the beam and the bottom is still sitting on a padstone, all the insulation padding of this world is not going to change much. We paid part of the job and then we pay instalments; there is still a lot of work to be done so I am sure they will be around! That is something I have definitely thought about a lot during my sleepless nights, however this is how the inner leaf of that wall looks like: the breeze block are not staggered, but simply piled on top of each other. Would you put a padstone w steel on top of that? The BCO is highly unlikely to pass the column anyway, I would have it taken down and toothed into the existing wall. also looking at the photo the RSJ is only resting on the outer leaf by 1 cm or so, therefore cutting it back to the web width wise and about 5cm in length would work. BCO passed it all; BCO was really ridiculous. It is resting on the outer leaf by 3.5cm, cutting it back to the web would create a risk for the RSJ to "tip over". In the end it has been agreed, since the RSJ is occupying only a third of the padstone, that the steel is going to have a little jacket at the end. I suppose compromises are the only way forward at this point. And she was adamant for us to get a 30-minutes fire retardant one, but we are still going to go for a 120-minutes one (unless it costs much, much more). Essentially, from my very first experience with BCO, I can take home that BCO is an utter joke.